6 pp. Roman, 160 pp. The contributions published in this volume were prepared within the framework of the research project Sprachliche Innovation und Konzeptwandel in Westafrika [Linguistic Innovation and Conceptual Change in West Africa] of the Institute for African Studies at the University of Vienna. 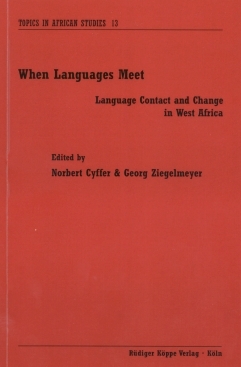 The purpose of the project was to examine the linguistic situation in West Africa with respect to language contact and change in its various facets. The linguistic situation of the West African Sahel region is characterized by ongoing social, historical, ecological and economical transformations. In this volume various aspects of linguistic dynamics which were caused by these transformations are examined. The editors believe that linguistic structures are not only charcterized by genetic affiliation, but also to large extent through language contact. While, at first sight, this is evident in the lexicon (e.g. borrowings), its traces are more intricate to detect in phonology, morphology or syntax. In connection with linguistic contact phenomena this volume particularly explores the following aspects – strategies of adoption of differing tonal systems, phonetic/phonological sound adaptation, alterations of T(ense)A(spect)M(ood) systems through language contact, syntactic subordination on different structural levels, sentence/clause structures which are influenced by contact, borrowing of function words, reduction of dialect features as an outcome of language contact, dynamism of code-switching and code-mixing, semantic shift in loan words. This volume aims to contribute to the framework of research for universals and new global tendencies of linguistic change.